How-to landscape & home repair articles for the DIY. Is your fence or deck looking gray and dirty? 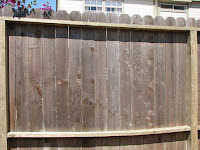 Do you have a brand new fence or deck with ugly black marks on the wood? Here's how to identify the problem and fix it. Left: Weathered redwood fence that has turned gray with age and dirt. 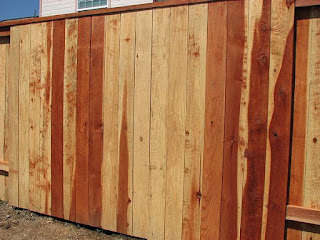 Right: Ugly black discoloration on a new redwood fence. Mold, Mildew, & Tannin Stains. Burns and other causes of discoloration. The easiest approach to the problem is to go through each of the steps below in order. They are ordered here starting with the easiest and quickest, and moving along to the more laborious and time consuming. Hopefully the discolorations will be reduced to an acceptable level before you get to the last, most labor-intensive step! 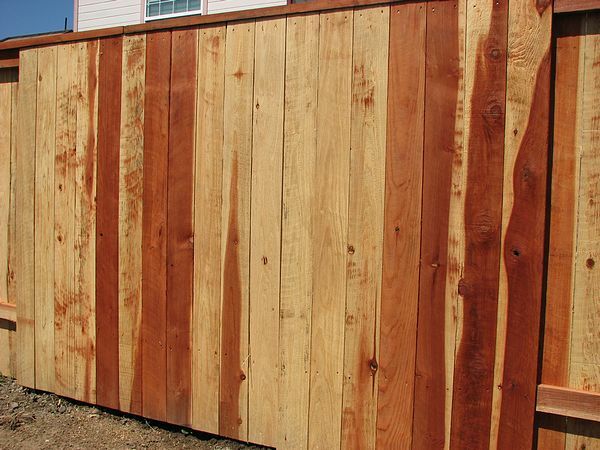 Now that your brand new redwood or cedar fence/deck is installed, as you stand admiring it, you realize it has black blotches on the wood. Some of the black marks likely appear as black swirls, others are streaks or small spots like paint drops. In still other areas, you may have splotches that look like hazy black clouds, or even black lines. What are they? How did they get there? Most of all, what can you do to get rid of them? 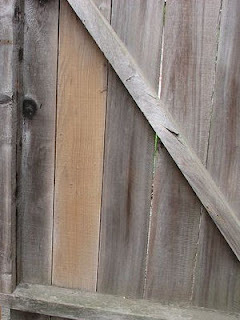 Here's some DIY solutions for ugly marks on your fences and decks. Same new fence as shown at the top of this page after cleaning and brightening. If this is a new fence or deck your first step is to ask yourself "is there really a problem, or is the color variation normal?" 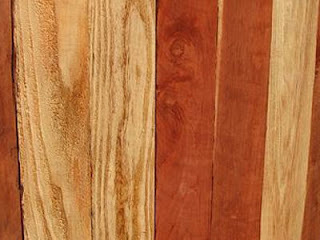 Some color variation in the wood is normal, especially for Redwood. Fresh cut cedar has a cream color. 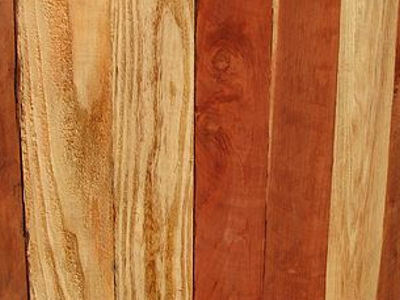 Fresh cut redwood varies in color from cream to a reddish pink. The cream colored wood is sapwood, from the outer perimeter of the tree. The reddish-pink wood is heart wood that is taken from the center of the tree, the red color is due to a chemical called tannin. Tannin is very rot and insect resistant. 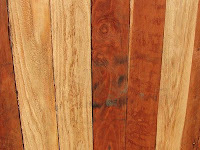 The tannin is what makes redwood so durable. So the red colored wood will hold up better over time. (That's something to consider when picking out redwood boards at the lumber yard.) Both cedar and redwood age to a silver gray color over time. Keep in mind that if you allow the wood to age to its natural silver-gray color, most color imperfections on fresh cut cedar or redwood will fade and become much less obvious over the course of 2-3 years. New redwood fence with normal color variations. Start by examining the black coloration. If the spots have a somewhat shiny surface and/or are raised slightly above the wood service they are probably caused by sap that has oozed to the wood surface. Sap will often be sticky if you touch it. Oil spots are less common, but periodically occur when oil drips on the wood while it is being cut at the sawmill. Sap and oil spots can both be removed using paint thinner. Take a small rag or paper towel, wet it with paint thinner, and then scrub the spot with it. It will take a little vigorous rubbing, but if it is sap or oil, the spot will dissolve and come off. Remember that paint thinner is very flammable, be sure you read the warnings on the can, and dispose of the used paint-thinner soaked rag properly! The next step is to go after black marks that are caused by tannin stains, mold or mildew. 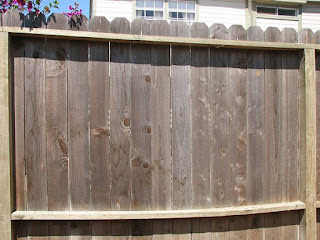 These are the most common causes of black stains you'll find on redwood and cedar fence/decks. As mentioned before, redwood and cedar wood both contain tannin. Tannin reacts with a number of things, such as steel in tools or nails, to create discoloration. Tannin discoloration due to the saw blade used to cut the wood is very common. Saw blade marks often appear as black swirl marks on the wood. Steel nails often cause a black spot around the head of the nail. (To minimize nail spots the nails used in redwood and cedar wood should be stainless steel, aluminum, or double-dipped galvanized steel.) Steel straps used to hold bundles of wood together for shipping also leave black marks on the wood. You will notice that the black tannin stains are worse on the redder areas of the wood, this is because the redder areas have more tannin in the wood. Mold and mildew simply grows on the cut boards while they are being shipped or stored. If you want to tell if a discoloration is tannin stains or mold/mildew simply put a drop of undiluted bleach on it. If it is mold/mildew it will fade away. Do this in an inconspicuous place. Concentrated bleach will discolor the wood. Some experts recommend a solution of one cup bleach and one cup of TSP in one gallon of water, sprayed on the mold to remove it. (Real TSP, not a TSP substitute.) This diluted bleach/TSP solution does not discolor the wood; however I have found that it is not very effective at removing the mold or mildew. If you dislike the silver-gray color of an older fence/deck, you can easily restore it to a lighter color by pressure washing it with water or brushing on an oxalic acid spray. However this will not restore the original shades of red & cream, which are lost as the wood ages and the tannin leaches out. Weathered redwood fence that has turned gray with age and dirt. 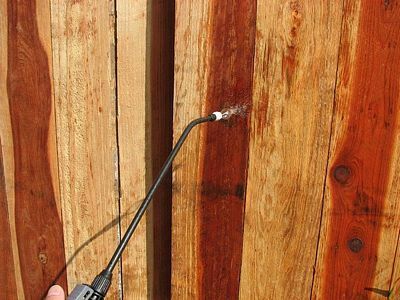 Spraying the fence with a high pressure steam of water using a pressure washer will do a good job of brightening an old gray fence. It has to be a 2000 PSI or more pressure washer, a nozzle on a garden hose alone will not have enough pressure to blast the dirty top layer of wood off. 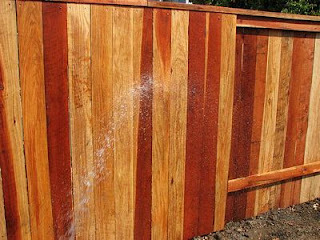 The high pressure water actually removes the outer layer of wood, so keep in mind that regular pressure washing will make your fence boards thinner over time. Be sure to hang a over-spray tarp behind the fence before you pressure wash it! (See instructions for making a over-spray tarp near the bottom of this page.) The high pressure spray will carry much of the dirty water through these gaps and onto whatever is on the other side of the fence. I have seen the dirt from the fence "paint" dirty stripes on the adjacent house's walls. (The neighbor's wall had to be pressure washed and the paint touched up!) You can build a simple frame for the tarp using 2x4 lumber. Oxalic Acid Treatment for both New and Old Wood. Use oxalic acid to remove dirt and both tannin stains and mold/mildew. Oxalic acid crystals are sold online and at some hardware stores. 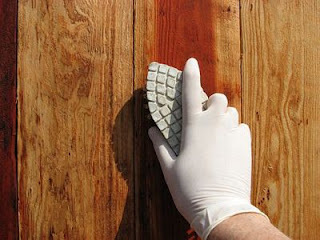 It can also be used to remove the gray color from aged wood, it turns the wood to a much lighter yellowish-gray color. Note: It will not restore the old wood to a completely fresh-cut look. Oxalic acid will not strip off previously applied sealers, stains or paint. For those situations you need to use a product made specifically for paint or stain removal. The brighter old fence board was treated with oxalic acid. Pressure washed board look similar. The lighter board on this old redwood gate in the photo above has been sprayed with oxalic acid. As you can see it does not restore the pinkish color of the redwood, but it does brighten it and removes many of the dark stains. WARNING: Oxalic acid is dangerous stuff. Use as little of it as possible. Avoid getting it on adjacent surfaces. It will damage or kill plants if sprayed on them. Wear chemical resistant gloves and eye protection. Wear a dust mask when opening containers of oxalic acid crystals and when mixing. Read all warning labels. Use at your own risk. 1. Cover any metal parts (except nails) of the fence/deck with plastic to protect them from the acid. Wear gloves and eye protection, remember you are working with acid! If there are gaps between fence boards place a over-spray tarp behind the fence to catch the spray that goes through the gaps. Cover any plants that might get sprayed with plastic drop clothes. 2. Make a oxalic acid spray solution per the directions on the box. Most people use 4 oz. of oxalic acid crystals per gallon of warm water to make the spray solution. One gallon of solution will typically treat about 400 square feet of wood surface, or about 66 linear feet of a standard 6 foot tall fence. Or use a cleaner solution that contains oxalic acid (see below). 3. Wet down the fence/deck with a hose, then allow a few minutes for the excess water to drain off. If water puddles on the wood, sweep it off, you want the wood to be just slightly wet. 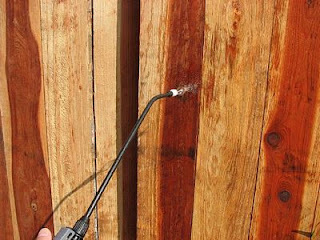 Spraying oxalic acid on a fence. 4. Use a standard plastic garden sprayer to spray the oxalic acid solution onto the wet wood. Make sure you use a plastic sprayer that does not have any metal parts. Apply the solution in small sections. If treating a fence, an 8 foot long section is a good area to work with at one time. Spreading the oxalic acid solution using a broom. 5. 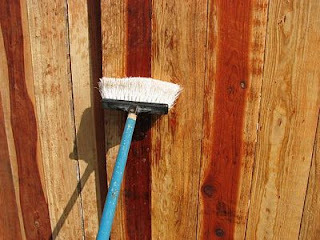 After spraying the solution on the fence/deck spread it evenly and rub it into the wood using a broom or brush. A standard plastic broom works very well. Do not use a wire brush. The black discoloration should start to fade as you rub the acid over it with the broom. Stains that are more persistent may need a second application, and a little scrubbing. Spot treat and scrub areas that resist cleaning. Rinse with a strong stream of water from a hose. 7. About 30 minutes after the initial acid application, rinse off the fence/deck with a strong stream of water from a hose. Allow to dry and the black coloration should be gone. The entire wood surface will also be slightly lighter and brighter in color than it was previously. How about using TSP? Some experts like to clean the fence/deck with TSP before applying the oxalic acid. This might be especially helpful if there's lots of mold on the wood. Use 1 cup of TSP per gallon of warm water and apply similar to the oxalic acid described above. Be sure to use real TSP not one of the TSP substitutes that are often sold as "TSP". Some of these TSP substitutes will turn your fence/deck black. 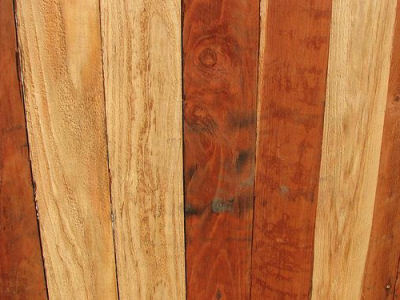 Sometimes black marks on redwood and cedar are the result of burning of the wood by a saw blade. Burning typically occurs when the wood jams in the saw and friction from the saw heats the wood and burns it. To remove burn marks sand them off using medium or coarse sandpaper. Standing is the final solution for removing any discolorations that the above methods won't remove. To make a Over-Spray Tarp simply get a 8'x10' plastic tarp, 40' of 3/4" SCH 40 PVC pipe, and 4 right angle glue-on PVC ells. Spread out the tarp on the ground. Lay a PVC pipe along one side of the tarp and cut it to create a length about 2" shorter than the tarp edge. Repeat so that you have a pipe cut to size for all 4 edges of the tarp. Using the ells connect the 4 PVC pipes together to make a rectangular frame for the tarp. Don't bother to glue the ells onto the pipes, they should stay put without glue. If you are using wood for the frame rather than PVC, use screws to attach the ends of the wood frame together. Now staple or screw the tarp to the PVC frame. Set the framed tarp behind your fence and use heavy duty string or small rope to tie it to the fence so it stays in place. Photo essays on famous, and not so famous, historic hotels and lodges. I've traveled all over the USA and taken tons of photos, mostly of National Parks. No they aren't professional photos. But the price is right and the website is fun to scroll through even if you don't need a free photo for a project! Sprinkler Warehouse provides a huge collection of free online tutorials on landscape irrigation. Most of the articles were written by Jess Stryker. © Copyright 2006-2019, Jess Stryker. All rights reserved.. Awesome Inc. theme. Powered by Blogger.